Fabulous but underused in the U.S., legumes (dry beans, split peas and lentils) are the latest update in AICR’s Foods that Fight Cancer. Economical: spend just a quarter and you get 1 cup of cooked dry beans that supplies one-fourth of your daily protein needs. A Nutrient Powerhouse: ½ cup cooked dry beans provides one-fourth of your daily folate requirement, along with substantial amounts of magnesium, potassium and iron. Packed with Fiber: That same ½ cup gives you one-fourth to one-third of your daily fiber needs. Versatile and Delicious: Dry beans, lentils and split peas can be incorporated into so many dishes, both hot and cold. They come in a wide variety of colors, textures and flavors, so you’re sure to find something you like. Read our eNews article for some great ideas to get started. 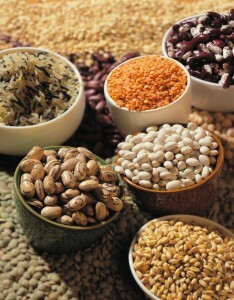 Cancer-fighting: Foods containing fiber (like beans) can reduce risk for colorectal cancer. And March is National Colorectal Cancer Awareness Month*, so it’s the perfect time to commit to adding more beans to your diet. Read about the research behind dry beans and cancer prevention, cooking tips and tasty recipes in our updated Legumes section in AICR’s Foods that Fight Cancer. *Colorectal cancer is one of the most common cancers in the U.S. and one of the most preventable. Read about the 5 things you can do now to reduce your risk of this cancer. What are your favorite dry bean recipes?